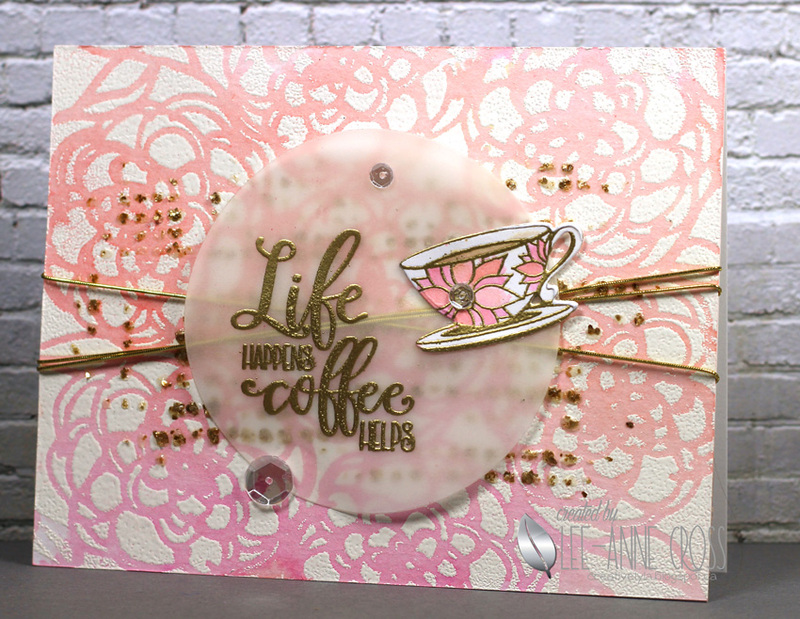 My background was made by adding Versamark through my stencil and then heat embossing in white. Then I added three colors of Distress Ink to my craft mat, spritzed them with water and dragged my watercolor paper through it. Once it was dry, I added some gold mica paste through a different stencil. 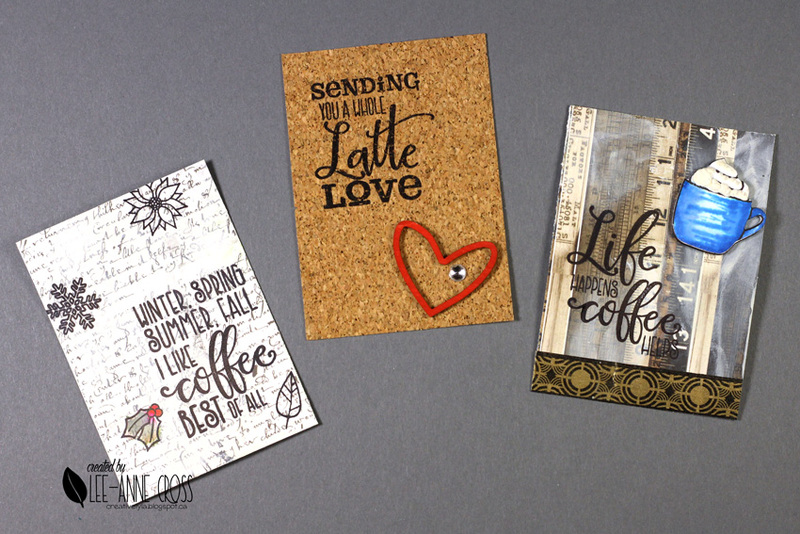 More heat embossing for the sweet little coffee cup and sentiment…this time in gold. Yes, I know, I’m still on that gold kick! A bit of gold cording and a smattering of sequins and done! Do you ever wake up in the middle of the night with a card idea? 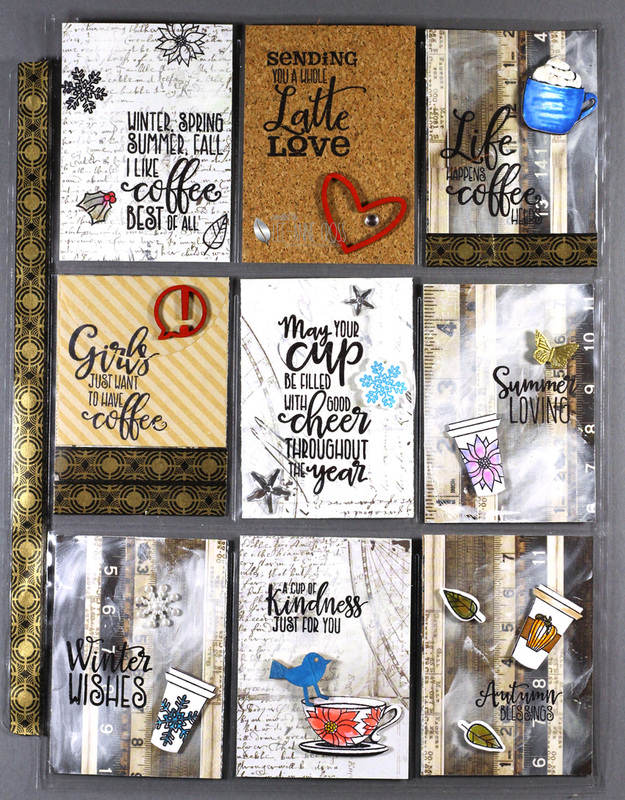 This one happened about 2:30 a.m. this morning 🙂 So I did go back to sleep but…had to make it happen this morning for the Coffee Lovers Blog Hop! And what coffee lover wouldn’t love to wake up to this in his/her garden? 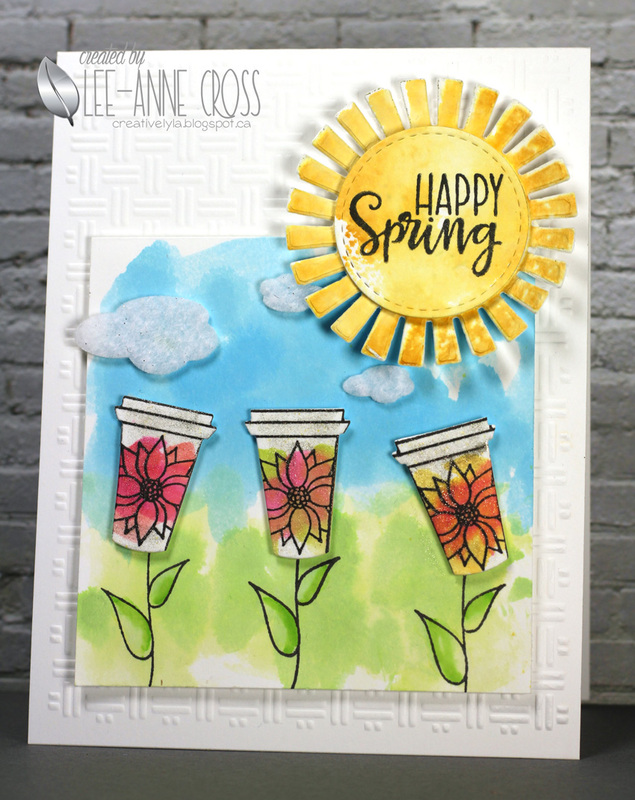 Watercolored the background with Distress Inks, the layered sun and the little coffee cups. Added some more color with some Distress Markers and some shimmer with some Wink of Stella. The clouds were die cut from some sparkly felt. It’s the final day of our March Spotlight Hops! Have you enjoyed the spotlights we’ve been sharing this week? Thanks so much for hopping along with us and celebrating the new release this week! Everything previewed this week is available to order in the Verve online store. 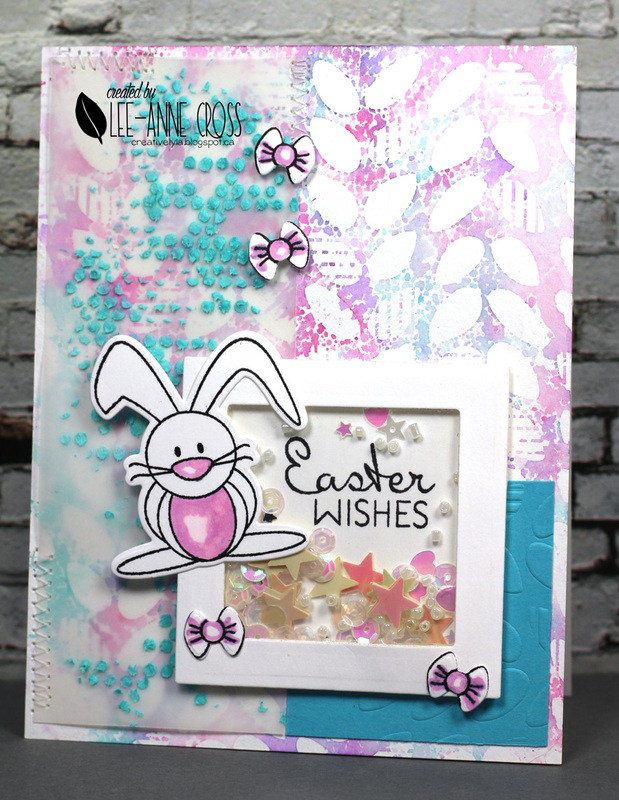 So come let’s hop along one more time for a closer look at Rise Above, New Beginnings and the Partly Cloudy and Springtime Stitches die sets. 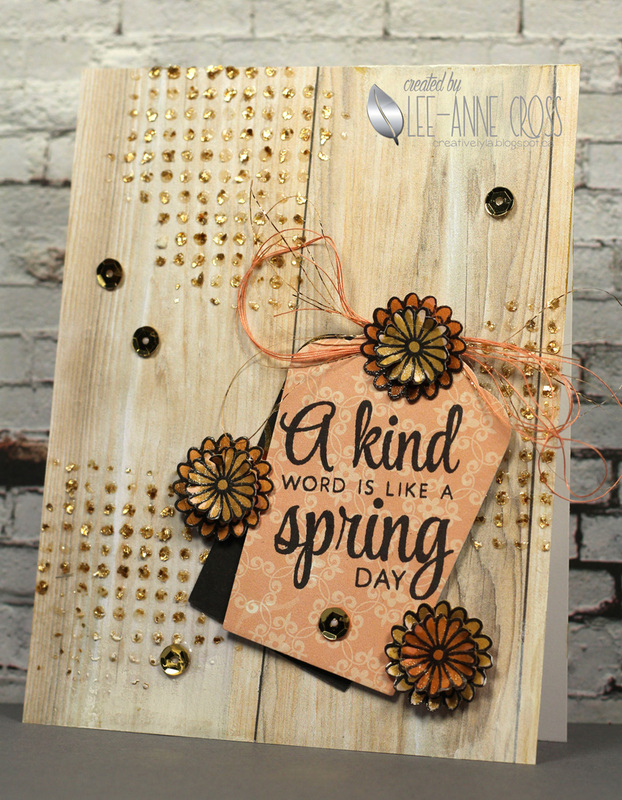 My first card today features New Beginnings and Springtime Stitches. I just adore those sweet little flowers and the variety of sentiments. It all starts with some paper I’ve been keeping hoarding for a while. For some background texture and sparkle, I’ve used a stencil and some gold mica flake paste. Then I die cut two Sweet Scallop tags in coordinating papers, stamping the sentiment on the top one. These little flowers make my heart sing:) They’ve been die cut in more coordinating paper, layered and shined up with some gold Wink of Stella. I’ve also snipped between the petals to add more dimension. For my embellies…some gold and peach thread as well as lots of gold sequins to add even more sparkle. This one starts out with some spray mists. Next, I added some light modeling paste through a stencil and added more randomly with a spatula. When the paste was dry I stamped the sweet little clouds and added some frosted mica flakes to the larger clouds. It adds texture and a lovely bit of sparkle. 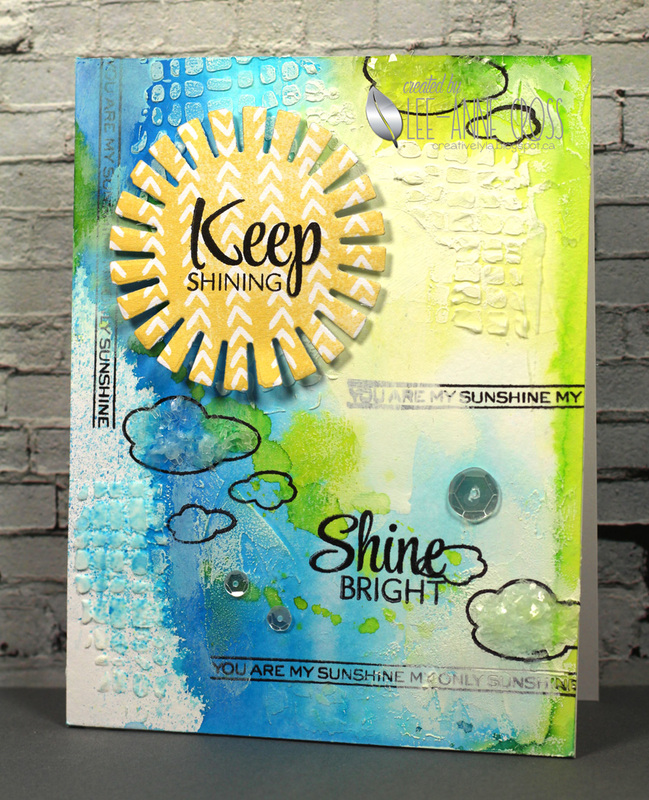 Then I stamped the wonderful “you are my sunshine” stamp randomly also, before adding some white gesso. Next, I added a sentiment from Rise Above. 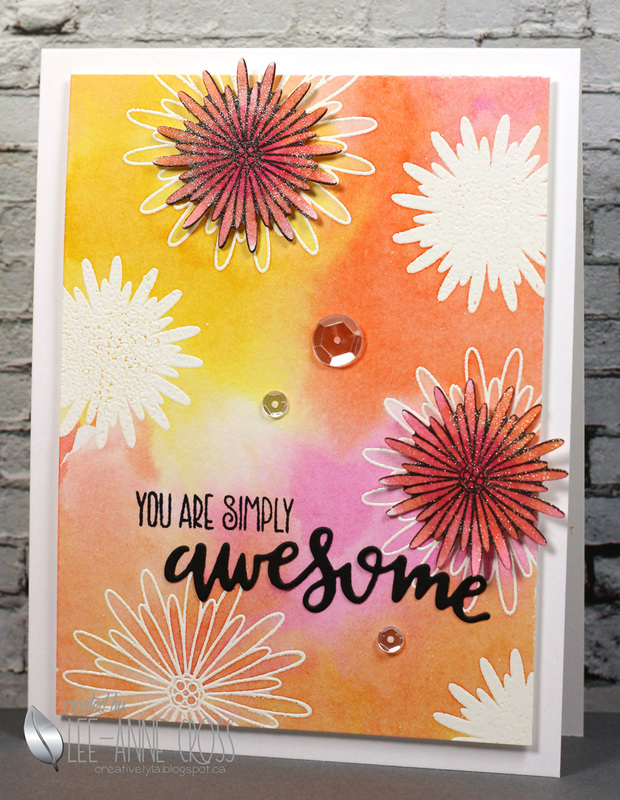 Mr. Sun is shining brightly in some die cut designer paper and stamped with a sentiment from Rise Above. And, for the final touch, a smattering of sequins. Welcome back to Day 2 of Verve’s March Spotlight Hops! The Verve Divas and special guests are back for another day of spotlighting our new release! Everything previewed this week is available to order in the Verve online store. 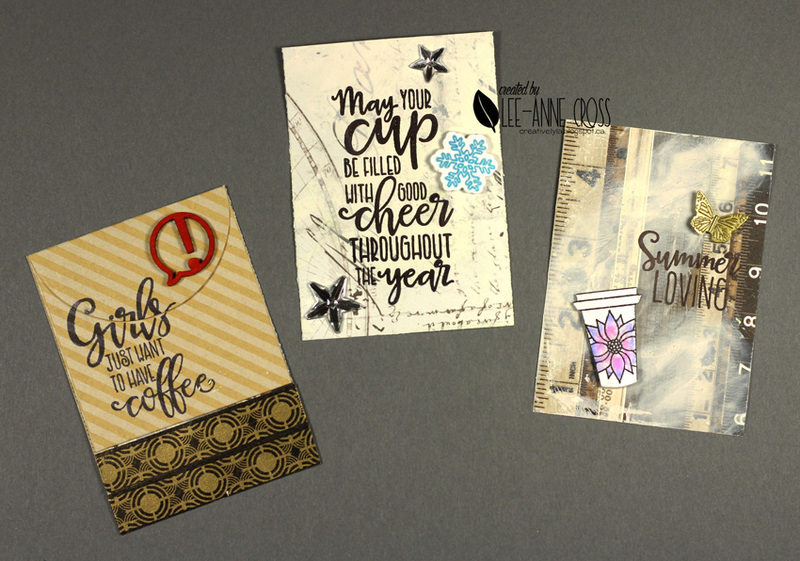 So come hop along and take a closer look at the Coffee Helps and Cup for All Seasons die set. 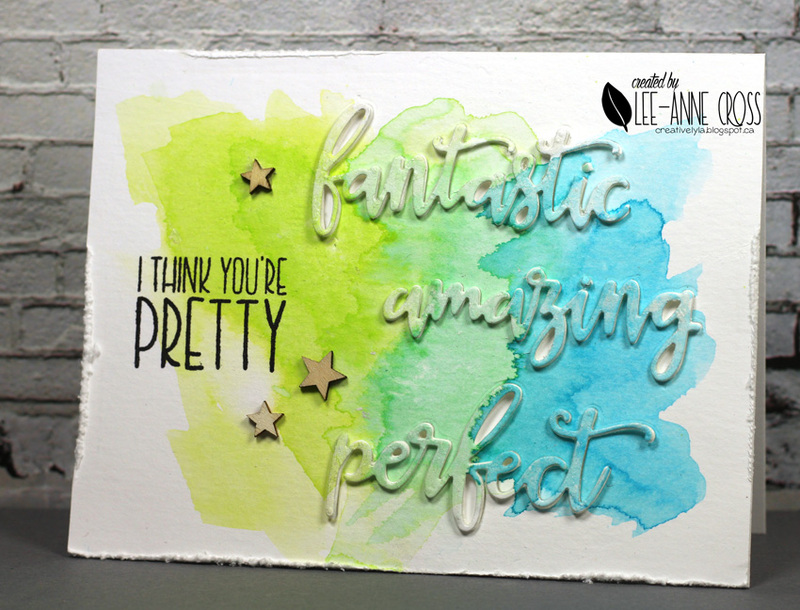 Today, I’m sharing a pocket letter to show the versatility of this set (among others). If you’re not familiar with pocket letters they were created by Janette Lane. Here’s a link to her blog explaining the background and how to make them. So pinch me, please! This girl is living the dream. So totally thrilled to be a Guest Diva for Verve over the next week 🙂 When Julee e-mailed me and asked if I’d like to do this hop it took me about 1.5 seconds to reply. Ummm. yes, hello?? ?, of course, I want to join in the hop and play with some shiny new Verve! So here it is…welcome to the first day of Verve’s March Spotlight Hops! It’s an exciting day as there’s a whole bunch of new Verve in the store this morning! 5 beautiful new sets, 6 die sets and a plain jane just released and they’re all available to order right now. Throughout the next week, we’ll be spotlighting each of the new sets with a hop to show you just how versatile these sets are. Today the Divas and special guests are showing you their first projects with the new release. And it’s designer’s choice, so you might just sneak a peek at a whole bunch of must-haves! For my background, I cut a couple of stencils from some heavy card stock using the two clouds from the Partly Cloudy Die Set. Then I added some white gesso through the homemade stencils with my finger. The oval is some designer paper that’s been stenciled with translucent gesso and rubbed with some more of the white gesso to soften the look of the paper. 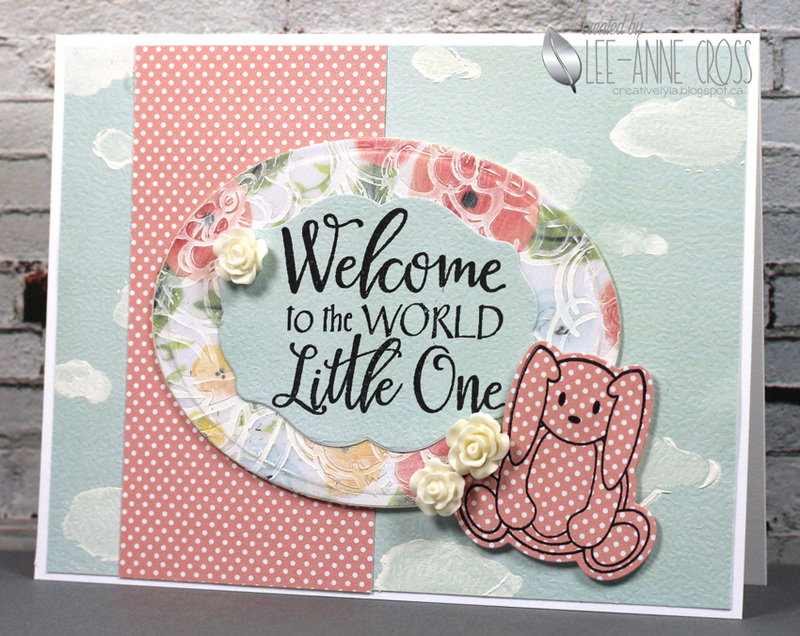 Don’t you just adore that sweet little polka dotted bunny? And there are two more adorable little bunnies in this set too! I’ve stamped the Welcome Plain Jane on some coordinating designer paper and die cut it with the Curvy Bookplate Die. 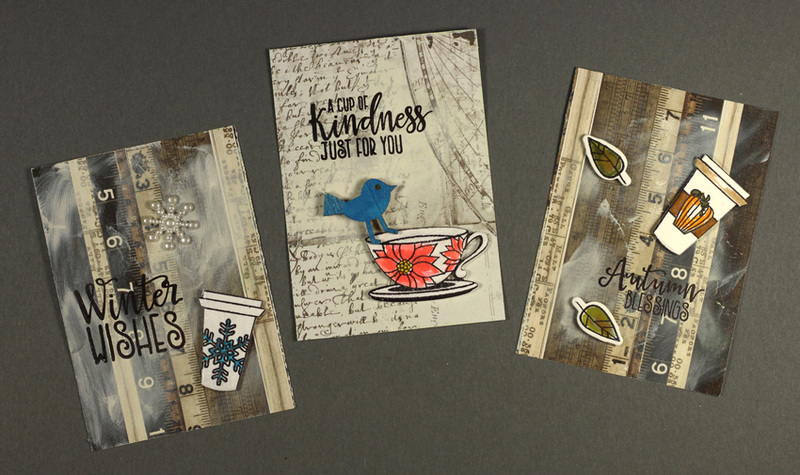 A trio of resin roses completes the card. If you’re hopping in the order of the hop list you should have arrived here from Laurie’s blog. And seriously you need to check out the hop…there are some fabulous prizes…too good to miss! From here why don’t you head over to Mackie’s blog and see what she has in store for you? Want to win some shiny new Verve? Today’s prize is a BIG one. We’ll be picking a random commenter on one of the hop spots below to win our ENTIRE new release! So be sure to leave a little comment on all the blogs below to increase your chances! Check out the Verve Blog today for the full hop list and all the prize info and deadlines!